A gorgeous high altitude resort town located in the foot hills of the Himalayas, Manali is most famous for its old world charm and the beauty of snow-capped mountains. The town is frequently visited by nature lovers, backpackers and adventure enthusiasts that come to explore the Tibetan marketplaces of Old Manali and the scale the mountain peaks that tower around the hill station. 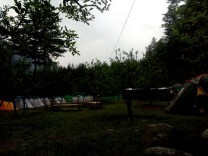 Your campsite at Manali is placed in the midst of sprawling apple orchards on the banks of the Beas River. Wake up to the gurgling sounds of the Beas River and rediscover the serene peace and silence of nature that is so often lost in modern life. • Explore the beauty of snow-capped mountains while camping in Manali. • Catch gorgeous views of apple orchards, the Beas River and lofty mountain peaks. • Spend the night in tents pitched at a photogenic campsite. A basic level of health and fitness is required to book this trip. 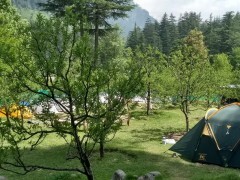 Camping in Manali is a non-strenuous activity. However, if you have any cardiac or respiratory conditions, or suffer from knee or spinal problems, please consult your doctor before booking this trip. Travellers are required to adhere to the instructions of the tour guide while undertaking any adventure activity while camping in Manali. Smoking or consumption of alcohol and narcotics is strictly prohibited during or before the trip. 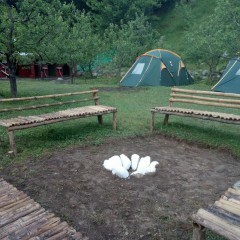 For cancellations made on or before 3 days prior to check-in date of camping in Manali: 30% refund. For cancellations made less than 3 days prior to check-in date of camping in Manali: No refund. 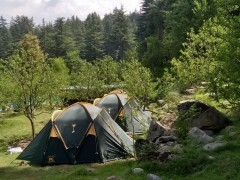 The tour operator reserves the right to cancel or alter the itinerary of the camping in Manali trip to maximize the safety of travellers as well as staff. Accommodation for children younger than 6 years of age is not charged. Accommodation for children between the ages of 6 to 10 years is charged at a discount of 50%. Accommodation for children older than 10 years of age is charged at full price. There is no pick-up point of this trip. 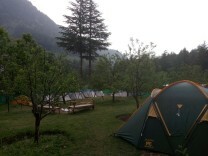 Day 1 of camping in Manali: Check-in and enjoy! 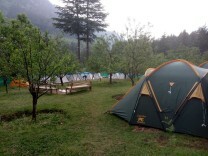 Arrive at the campsite at Manali by 12:00 hrs and check-in to alpine tents. You can spend the rest of the day at leisure. Visit the bustling temples of Hadimba or Manu and marvel at the intricate architecture of ancient India. You can also visit Vashist's natural hot water springs that make bubbling hot water not far away from the cool waters of the Beas River. Visit the famous Manali Mall Road and check out the quirky cafes and Tibetan markets of the city. Despite being located at a short driving distance from most major attractions in Manali, your campsite offers amazing views of Manali's snow-capped mountains. As you return from a day of adventure or leisure, lose yourself in the nocturnal beauty of the Himalayas and drift into a restful sleep in your tents. 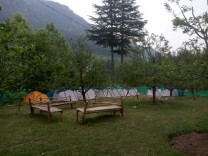 Overnight at Manali in tents. Wake up to the morning mist of Manali and go out for a short walk or jog around a pristine campsite. You will check-out of the campsite by 11:00 hrs. Depending on availability, you can even extend your stay at the campsite. Your trip ends here. 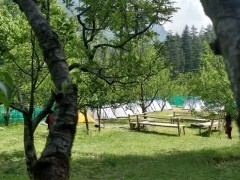 The check-in time at the Manali campsite is 12:00 hrs. 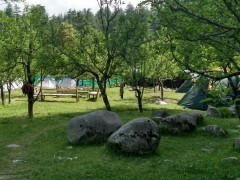 Situated in the midst of apple orchards of Old Manali, your campsite offers accommodation in dome tents on a triple-sharing basis. Sleeping bags and mattresses will be provided for a comfortable night's sleep. The campsite is equipped with common kitchen/dining tents and toilet tents. Today's meal package includes dinner. Today's meal package includes breakfast. 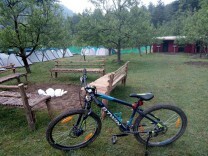 Check-out time at the Manali campsite is 11:00 hrs. 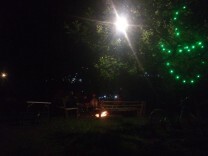 Depending on availability, you can also extend your stay at the campsite. Your trip ends here. Manali is well-connected to most major cities of the country via flights to Kullu-Manali airport at Bhuntar. You can take local transport from the airport to reach the Manali campsite, located 2-hr drive away from the airport.